What’s your favourite thing about the holidays? For me, it would be spending time with my family, visiting friends and baking. I’ve always loved baking, and holiday baking is what I enjoy most. 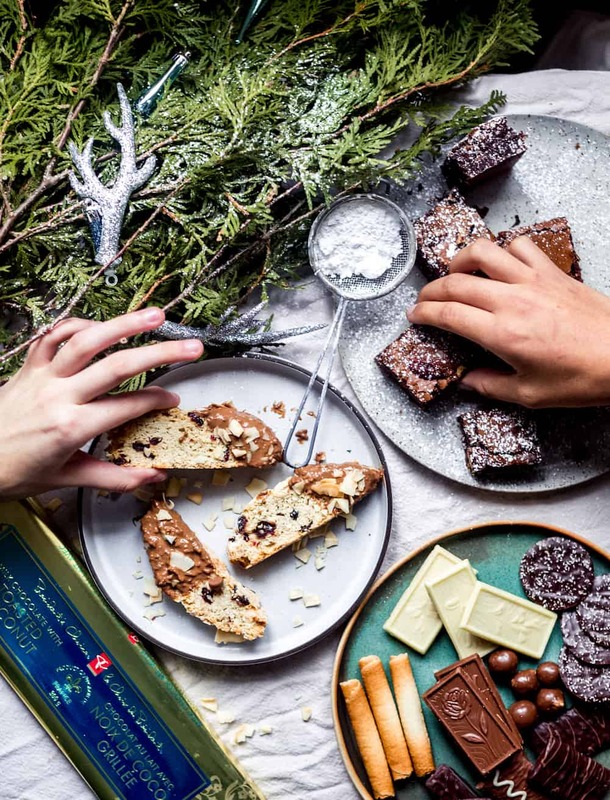 Anything from Linzer cookies, to bars and brownies (which aren’t technically a holiday cookie, but they’ll always be the ultimate treat for me). The first time I went to a cookie exchange party a few years into calling Canada my home, I spent days baking a few of my favourite cookies. Most of them were family recipes that my mother in law had graciously shared with me. Her almond crescents are still my favourite cookie. Crumbly and delicious, scented with almond extract. Also, classic thumbprint cookies, rolled in pecan pieces and filled with homemade jam. Over the years I’ve added a few other recipes to my holiday repertoire, and would spend a few days baking them for friends and family. My kitchen became cookie central, and I would make six or seven recipes. With time this holiday tradition has taken a more manageable approach, so I can spend less time prepping and more time enjoying. This holiday season, the girls, Warren and I will go to the Dominican Republic to visit family. Before we leave, I wanted to make sure we had a baking day at home, and make a few of our favourites. While we were baking up a storm, we decided to snack on some PC ®appetizers including super flavourful PC ®Bang Bang Shrimp and PC® Squash, Kale and Beet Flatbread. These appetizers helped to tide us over as we got busy in the kitchen. 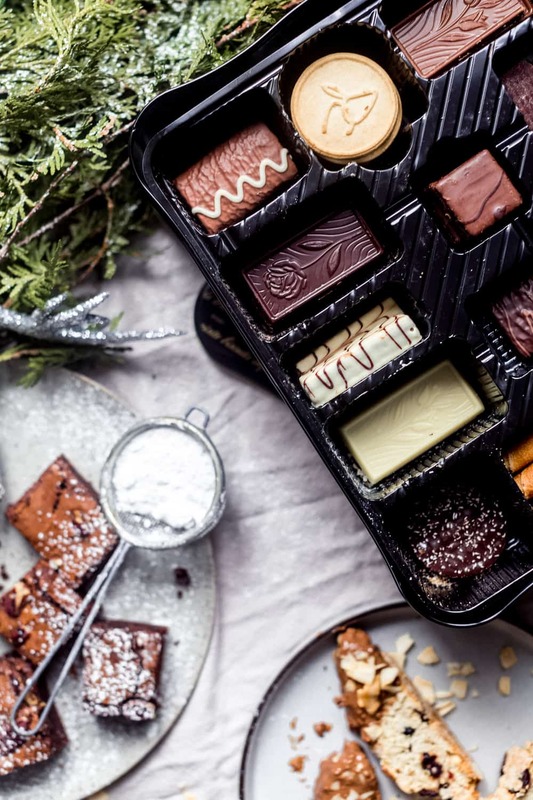 Instead of making countless batches we narrowed it down to three recipes that are festive, delicious, and also fit tightly into little tins for gifting. To make our day even better I also opened a box of PC®’s Luxury Biscuit Assortment from their Holiday Insider Collection. 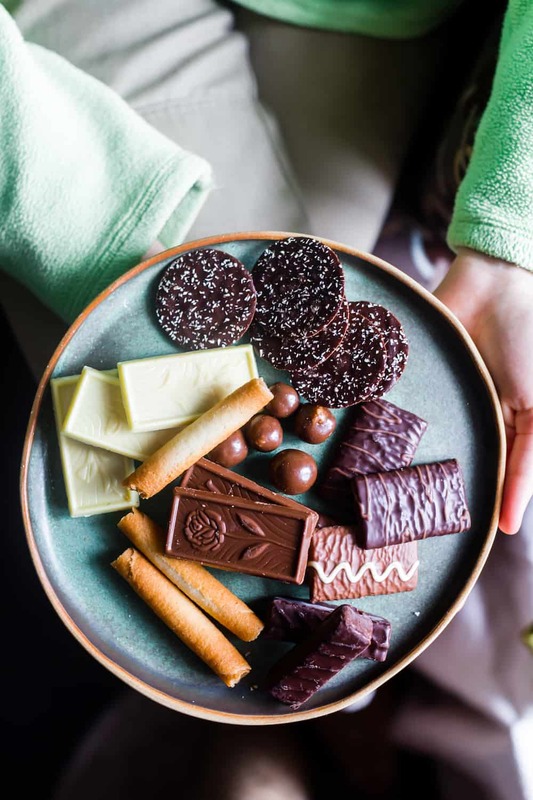 This tin is filled with so many goodies, including chocolate covered cookies and delicate vanilla curls. 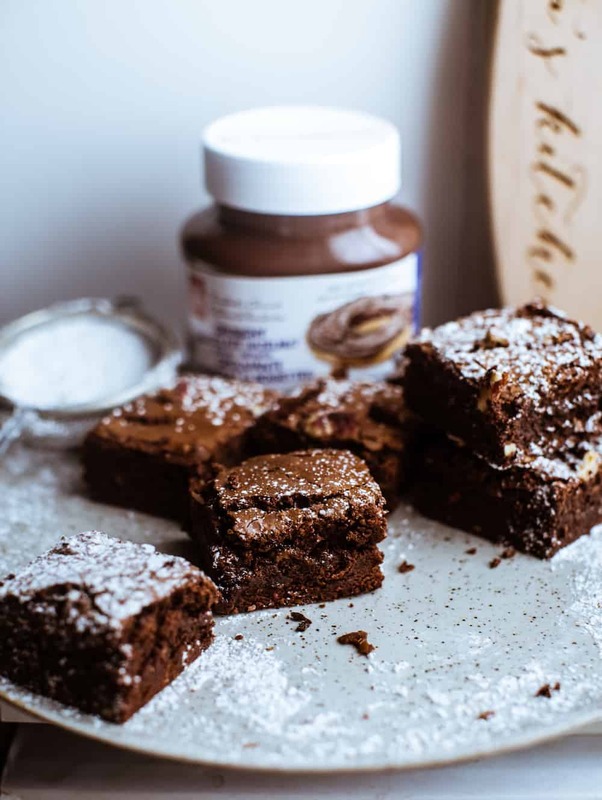 Today I’m sharing with you two of the recipes we made, starting with silky hazelnut brownies. 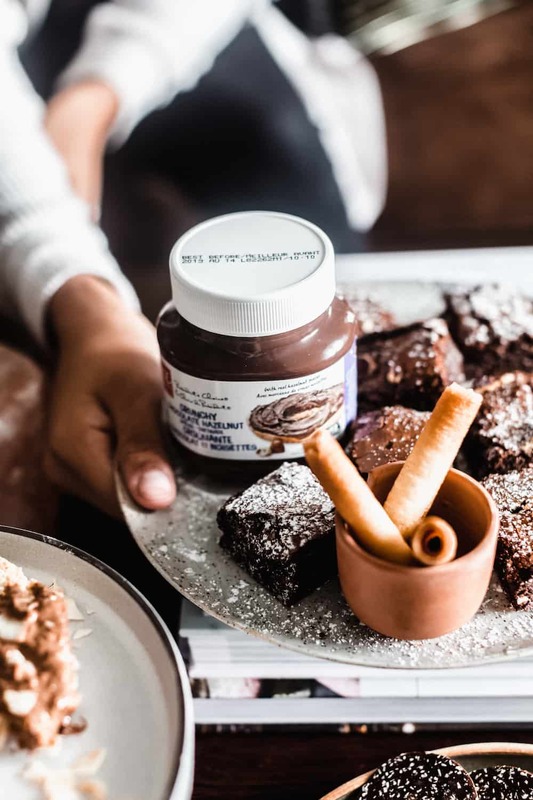 They get their luscious texture thanks to PC® Chocolate Hazelnut Spread, a classic great made even more irresistible with the addition of finely chopped hazelnuts for a subtle crunch. I’ve also added PC®’s decadent milk chocolate chips. 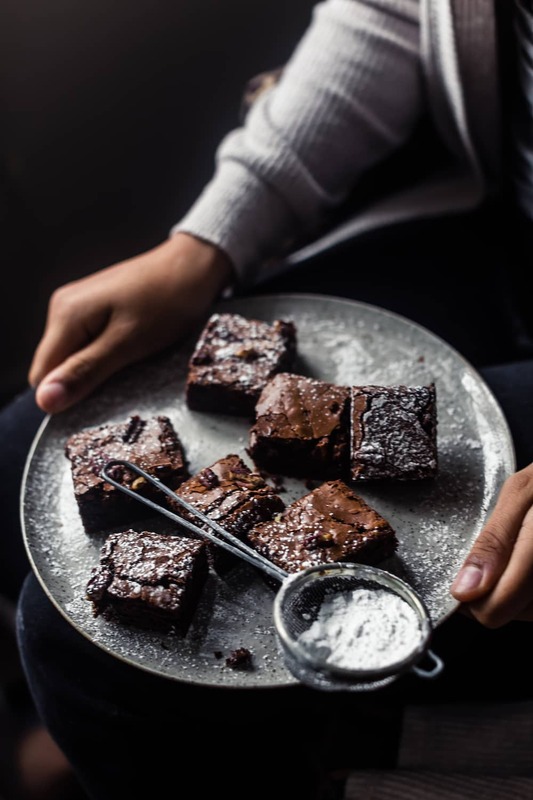 These two ingredients give the brownies a smooth crumb and crackly top. They come out chewy, fudgy and slightly gooey. 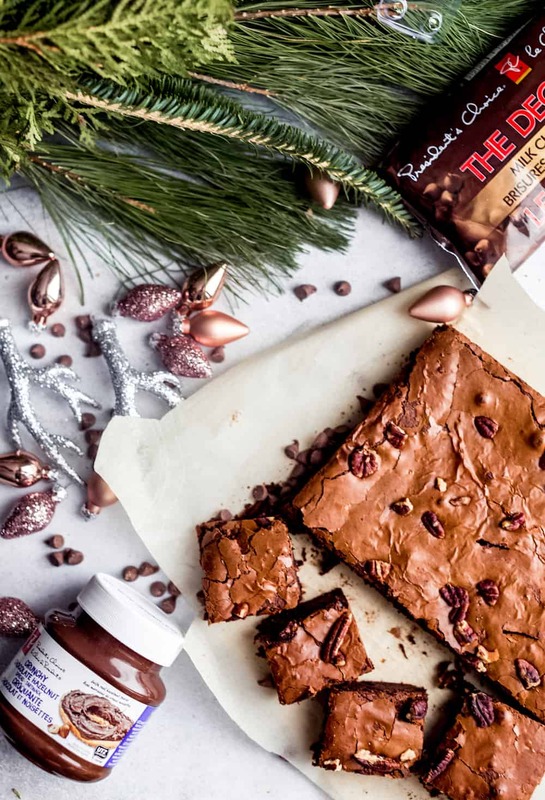 All the things I want in a brownie. In a large microwave safe bowl, combine chocolate chips, unsweetened chocolate and butter. Heat for one minute then stir. Continue to heat the chocolate and butter for thirty second bursts, stirring between each time. Be sure that the mixture is completely melted and not scorched. After slightly cooling the mixture, stir in PC Hazelnut Chocolate Spread. In a large bowl, use an electric mixer to combine eggs and sugar on a medium-high speed until the eggs are well beaten, and the mixture is thick. Beat in the vanilla extract, then stir in the chocolate mixture with a spatula. Add flour, salt and cocoa, gently folding everything together without over-mixing. Pour the batter into the lined/greased baking pan. Bake until a knife put through comes out with moist crumbs, which should be about 35-40 minutes. Be cautious not to over bake. Allow to cool to room temperature. You can serve them this way, warmed or chilled. The second recipe we made were the Cranberry Almond Biscotti dipped in PC®’s Milk Chocolate with Toasted Coconut bar. 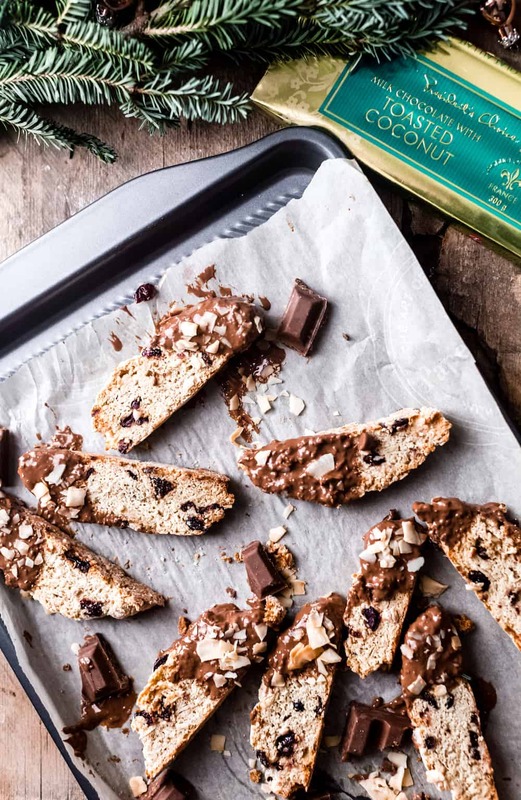 Biscotti often gets a bad rap for being too dry. 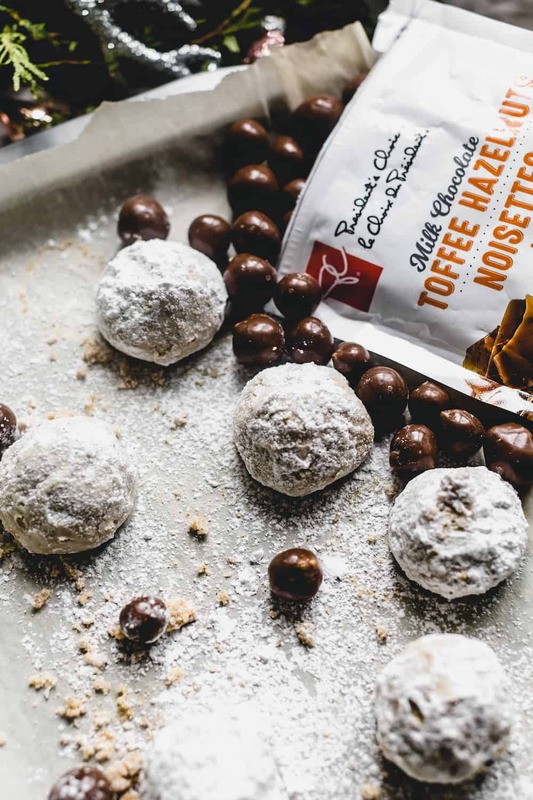 These on the other hand have a softer crumb, chewy texture and are studded with tangy cranberries that balance the sweetness of the chocolate. PC®’s Milk Chocolate with toasted coconut is silky and creamy with just the right amount of sweetness, plus nutty toasted shredded coconut. Delicious on its own but even better melted to dip the biscotti. It gives the recipe a true holiday feel. We baked the biscotti on PC®’s Non-Stick Carbon Steel Textured Cookie Sheets. These baking sheets are such a game changer! They are designed with a textured surface that increases air flow, ensuring that head is transferred evenly. This is especially important when baking a big batch of cookies at once. Preheat your oven to 160 C (325 F). Place the flour, baking powder, sugar, and almonds in a bowl and mix together. Add eggs and vanilla, then mix well to form a dough. Then, divide the dough into two equal parts. Place the dough on a lightly floured surface and knead each piece until smooth. Shape into logs and flatten slightly. Place both logs onto a baking sheet lined with parchment paper, then bake for 35 minutes. Once cooled down, cut the logs into quarter inch thick slices. Place these slices on a baking sheet lined with parchment paper. 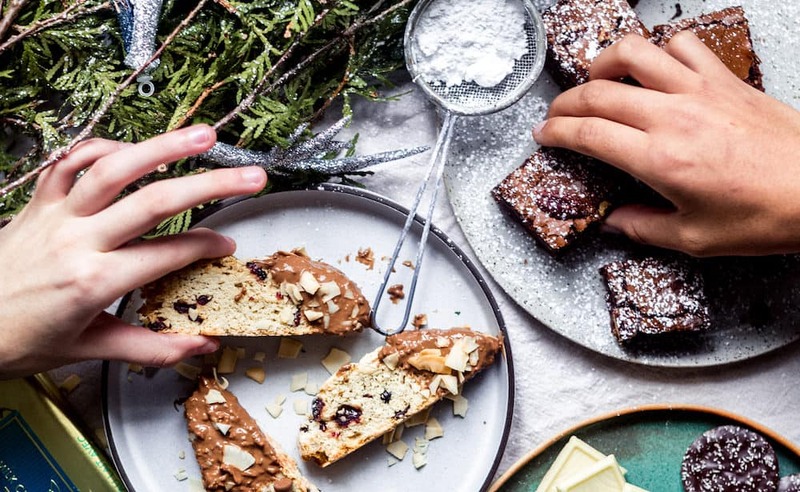 Bake the biscotti for 10-15 minutes, until crisp. The biscotti can be stored in an air tight container. If you are planning your own cookie exchange party this holiday season, I hope you love these as much as I do and share with the ones you hold dearest. *This post was made in collaboration with President’s Choice, however all views, opinions and recipe creation are my own.